Disruption theory has become a very controversial topic of late. This is especially true for what some refer to as the "theory of low-end disruption". One of the most common misconceptions about "low-end" disruption is that it is only applicable to enterprise markets and not consumer markets. The goal of this post is to highlight examples of "low-end" disruption and value chain evolution in consumer markets and put to rest a few other common criticisms of the framework. Clay Christensen defined a “new market disruption” as one that changes the basis of competition in the marketplace and initially competes against non-consumption. In contrast with this dynamic, a “low-end disruption” takes root in low-end segments of an existing market which may be overserved. Improved technology enables new business models to emerge that are based on lower cost structures. Low-end disruptors with extendable business models then move up-market by offering “good enough” products at lower price points. Underserved sections of the value chain need proprietary architectures or vertical integration to maximize performance, while modular architectures can provide more cost-effective solutions in overserved sections of the value chain. You can read a more detailed write-up here. One of the most commonly used counter examples of "low-end" disruption in consumer markets is the automobile industry. Unfortunately, most critics who use this example are unduly focused on recent history. Unlike the technology industry, the rate of product improvement is much slower in traditional industries like automobiles or apparel. Therefore, in order to truly understand the onset of modularity and impact of low-end disruption, we need to go back a few decades. In the 1960s, General Motors held a ~50% share of the US automobile market and 80% of the industry's profits. General Motors' integrated value chain allowed it to dominate the industry in an era where products were still not "good enough" (with respect to performance and reliability). But as automobile performance improved, modular, "low-end" disruptors like Toyota attacked it from below and profits evaporated. Toyota did not succeed by immediately attacking the premium segment of the market. It started with the low-end Corona and "then moved up-market by introducing sequentially its Tercel, Corolla, Camry, Avalon and 4-Runner models, and ultimately its Lexus". Honda and Nissan followed similar approaches to disrupt integrated incumbents like General Motors, Ford and Chrysler. Now, these disruptors are in turn facing low-end disruption from the likes of Kia and Hyundai. Interestingly, this pattern is very similar to what we saw in the PC industry. Integrated computing companies captured 80% of the industry's profits in 1986, but their share dropped to 20% by 1991 because of modular, low-end competition. The only difference in these patterns is the effect of Moore's law, i.e. the rate of product improvement. Industry and value chain shifts that take years in technology could take decades in other industries. This is the primary reason why frameworks like Porter's "three generic strategies" are perfectly valid in traditional industries, but not in the technology industry. Value chain evolution has also been evident in the apparel industry. As the quality and longevity of apparel have become "good enough", the power to brand has migrated from companies that were integrated from manufacturing to retail (e.g. : Levi's, Gant) to the store or channel itself (e.g. : Abercrombie & Fitch). But again, as in other traditional industries, these changes took place over decades and not years. The biggest reason for this "low-end disruption vs. consumer markets" dissonance is because the theory is sometimes viewed as a set of "two laws" -- one that deals with "new market disruption" and another that deals with "low-end disruption". The reality is that both new market and low-end disruption are two potential outcomes of a single, unified, strategic framework. Disruption theory is based on a singular premise -- improvement in product performance typically outpaces the performance that mass market customers can utilize. This measure of performance could be any attribute that is valued by the mass market (basis of competition), be it reliability, user experience or any other attribute. It is also important to understand that disruption affects the mass market and not the niche, luxury segment of the industry -- for example, luxury manufacturers like BMW, Daimler, Jaguar, Land Rover and Porsche own a combined ~6% of automobile volumes in the US. Highly refined versions of these Disruption-based models had produced more than 3,400 blind, real-world predictions about business survival or failure. These predictions informed more than $100 billion in organic growth, venture capital, stock trades and acquisition investments. When the models predicted survivors, they were right 66 percent of the time. When they predicted failures, they were right 88 percent of the time. Adding all survival and failure predictions together, the total gross accuracy was 84 percent. The disruption framework has been tested with a sample of 3,400 cases totaling $100 billion in investment. If "low-end" disruption was truly not applicable in a field as large as "consumer markets", one would expect its accuracy to be far lower than 84%. Of course, none of the examples or data points mentioned in this post are new. Students of disruption theory have known about these for years. So why do critics continue to use the same arguments against the framework? The problem is that disruption is counter-intuitive. Critics are typically the most demanding consumers of the product category in question (be it in education or consumer technology) and find it difficult to envision buying a cheaper or simpler product because it happens to be "good enough". The problem is that the needs of this niche, high-end customer segment have no bearing on the efficacy of disruption. 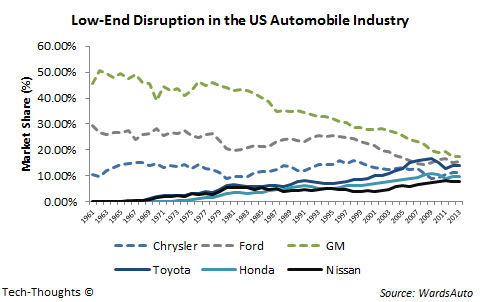 In reality, disruption takes root among the least demanding customers (or non-customers) of an incumbent before expanding to the mainstream market -- for example, Toyota entered the US automobile market with the low-end Corona. Ironically, the biggest reason why disruption still works as a concept is because well-managed incumbent companies look to increase profitability by focusing on the needs of their most valuable or demanding customers. This is not to say that disruption, or any framework for that matter, is perfect (the statistics show as much). But if our goal is to improve the framework, we need more nuanced and objective viewpoints.